Police repression has failed to stop a wave of protests sweeping Mexico demanding the return of 43 kidnapped students in the state of Guerrero and the resignation of President Enrique Peña Nieto. On Sept. 26, 43 indigenous students from a teacher training college in Iguala, Guerrero, disappeared. They were collecting funds so they could join a demonstration in Mexico City to remember the hundreds of protesting students killed by the Mexican army in 1968. Federal officials stated that local police, on the orders of a mayor affiliated to the center-left Party of the Democratic Revolution (PRD), arrested the students and then handed them over to gunmen from the local drug cartel who then killed them and burned their bodies. Three members of the drug cartel “confessed” that the mayor ordered the students killed. 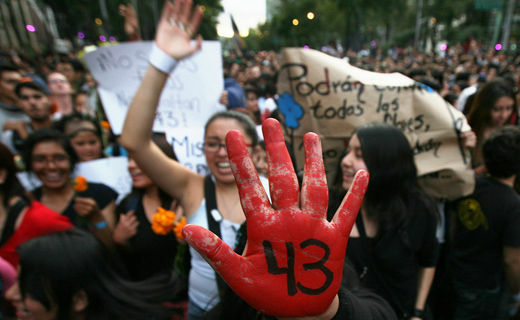 Initially, federal officials claimed to have located a mass grave containing the ashes of the 43 students, but could not prove they belonged to the students. While federal and state police and local residents continue to uncover numerous mass graves in the search for the students, so far the remains of only one disappeared student has been confirmed. On Dec. 6, federal officials, with the help of an Argentinean forensic team, announced that a DNA test confirmed that bone fragments found near a garbage dump in Guerrero belonged to Alexander Mora Venancio, 19, one of the missing students. A sample was sent to a university laboratory in Innsbruck, Austria, which confirmed the identification. The disappearance of the indigenous student teachers, called “normalistas” (students at a normal school), has triggered public outrage and massive ongoing demonstrations across the country, attended by millions. Demonstrators, tired of widespread poverty, violence, and corruption, are demanding that the federal government find the disappeared students and that Peña Nieto resign. The right-wing Institutional Revolutionary Party (PRI) government of Peña Nieto, which came to power through massive vote-buying and ballot box rigging in 2012, lacks widespread legitimacy across Mexico. Millions still believe that Andrés Manuel López Obrador, who ran twice for the center-left PRD and officially lost by a narrow margin, is their real president. Authorities are using harsh methods to deal with demonstrators. Mexican student activist Varinia Emiliana, 19, who has been taking part in demonstrations in the Federal District (DF), that includes Mexico City, said in an email interview that national, state and local police are attacking protest marches on a regular basis with tear gas, clubs and live ammunition. They are also using agents provocateurs to create a pretext to break up demonstrations and arrest protesters. She blamed PRD governor of the Federal District, Miguel Angel Mancera, for ordering attacks against demonstrators. At the Nov. 20 demonstration, attended by tens of thousands in the Zócalo (the vast city square in front of the National Palace and cathedral in downtown Mexico City), she saw district police, who are under Mancera’s command, begin violently dispersing protestors at 8 pm. “In each march that I have gone to, there have been agents provocateurs, persons sent by the Peña government to provoke demonstrators pretending that they are civilians and on the side of demonstrators.” Varinia Emiliana said that protestors at the Nov. 8 demonstration in Mexico City were able to use their cell phones to make videos of an undercover police agent encouraging protestors to set the doors of the National Palace on fire and then afterwards giving orders to the police to begin arrests. Organizers now take security measures to prevent provocateurs from infiltrating demonstrations. Public pressure has also forced the resignation of the head of the Granaderos, the riot police. Many activists across Mexico are using cell phones to make videos of police attacks and then putting them on YouTube and Facebook. Varinia Emiliana said police are also abducting key student organizers and leaders. One student leader from her university was grabbed by the police as he was heading home. But people nearby with cell phones took videos of the kidnapping along with the car license plate, allowing them to track down the student and free him. One of the female prisoners was tied down, stripped of her clothes, and then photographed. Furthermore, police accused the 11 of being tied to organized crime. “In Mexico, they must change this type of situation because the presumption of innocence is a right, and the government just should not make rhetoric and speeches about this,” Jiménez stated. Deputies from the PRI, National Action and Green Parties in the National Assembly just approved reforms to articles 11 and 73 of the Constitution that will give federal, state and local governments the right to ban and restrict demonstrations, using the pretext of guaranteeing universal mobility. Opposition deputies from the PRD, Workers Party and the Citizen Movement condemned the changes, saying they will criminalize protesters and restrict freedom of expression and the right to demonstrate. Despite government repression and intimidation, protestors are adamant that they will continue demonstrating until the normalistas are returned and Peña Nieto resigns. “Vivos se los llevaron, vivos los queremos” (Alive they took them, alive we want them) has become the universal slogan uniting protesters across the country.